When I picked up this book, I knew nothing of the controversy surrounding it. I originally put it on my to-read list clear back in 2010 (so reading it fulfills one of my reading goals for the year) because someone had recommended it as a good read for book club. It has yet to be chosen as our selection for the month, although it was discussed once again as a possibility for May (but we went with The Crossover instead). 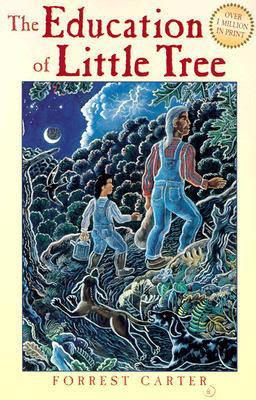 But controversy aside, I had some misconceptions myself about the book--mainly that it was a middle grade novel. It is not. I don't know if I thought that because the main character is a young boy or if someone actually misrepresented it as a children's novel, but I repeat: it is not. I'll get into the reasons why in a minute. The story begins when Little Tree is five years old and his fate is being decided by his relatives after his mother's death. It is written in an autobiographical style (and I guess originally it was falsely promoted as the actual autobiography of Forrest Carter), but it's mostly, if not all, fictional. Little Tree is raised by his Cherokee Granma and Granpa. They live a quiet, but full, life in the mountains, and Little Tree soon grows to love everything about them. His Granpa is in the whiskey-making trade, and Little Tree soon learns all the ins and outs of it, including what to do if someone comes snooping around looking for the still. Little Tree loves his life on the mountain. He loves playing with the hound dogs and watching the sun rise and visiting with Willow John and Mr. Wine. At five years old, he does his best to help out and keep up with his Granpa. The two of them make quite a pair, sending off the hound dogs on a fox hunt just for the fun of it or spending the night in the open air on the mountain or writing off religion as something not for them. I think if I'd read up on Forrest Carter (a pseudonym for Asa Earl Carter) before reading the book, I would have been so turned off by his shady activities and duplicitous nature that I wouldn't have read it. And that would have been kind of sad because I actually quite enjoyed it. And even though Carter was charged with being a white supremacist, I can honestly say that I didn't pick up any hint of that while reading, not at all. So instead of talking about Carter's deplorable choices, let's revisit my false assumption that this was a children's book. Think of it along the same lines as To Kill a Mockingbird. Even though Scout is the main character, it's written for a more mature audience, and I think the same is true for The Education of Little Tree. There's a fair bit of swearing (Granpa has a salty tongue, and Little Tree adopts it), as well as some rather startling, if brief, descriptions of the more sensitive facts of life. I just think overall it would be better suited for teenagers, but I'd love to have you weigh in with your opinion. Little Tree's voice was both quaint and perceptive, and I was completely taken with it. One of my favorite chapters was when he told about letting the hounds loose to trail a fox. Everyone (including the fox) seemed to be in on the fact that it was all a game, but that didn't lessen the excitement of it. The hounds started out in a wide circle, finding the fox's scent and going after it. Granpa and Little Tree watched from the sidelines. The chase went on for most of the night while the fox, sneaky and sly, evaded them. I felt like I was sitting on the mountain with Granpa and Little Tree watching it all unfold and laughing right along with them when Bess and Rippitt fell for the fox's trick and lost his scent on the other side of the creek. It was truly delightful. "You can't cheat without making unnecessary trouble for yourself." "You could make bad judgments about any trade, giving it a bad name, if you judged by the worst that was carrying on the trade." [After Rippitt died and Little Tree confided that he felt so bad and empty about it]: "Granpa said he knew how I felt, for he was feeling the same way. But Granpa said everything you lost which you had loved give you that feeling. He said the only way round it was not to love anything, which was worse because you would feel empty all the time." "If ye don't know the past, then ye will not have a future. If ye don't know where your people have been, then ye won't know where your people are going." "If a hound or anybody else has got no feeling of worth, then it's a bad thing." And to nearly all of these statements, Little Tree would tack on his, "Which is right" or, "Which proves out as reasonable" on the end of them. In spite of Forrest Carter's failings, I really think he wrote an exceptionally poignant and emotional novel. Like I said at the beginning, as I was reading, I didn't pick up on any racial prejudice or injustice (there are characters within the story who are unkind or prejudiced but they are represented as such). Maybe I'm just a naive or unperceptive reader, but what I found instead was a story with heart and wisdom and depth. If I started judging all books by the conduct of the authors who wrote them, I guess I wouldn't get to read very many books. Like you, I read the book first and the controversy later, and I also enjoyed it. I haven't had any luck getting kids to read it, which goes with your thoughts that it's really aimed at adults. I think it feels more like how adults like to think their childhood went than how it really feels for kids. And, of course, I'm hesitant to recommend it to people because of the author. But I agree that books should stand on their own. I've also read some complaints from Cherokee Nation members that it misrepresents things, which does make me reluctant to give the book to kids. I barely remember reading this- so thanks for the reminder. I remember really loving it and when I joined goodreads I remembered it well enough to rate it but was shocked when I began reading reviews which discussed some of the controversies. I wonder if I would enjoy it as much now as I did originally.